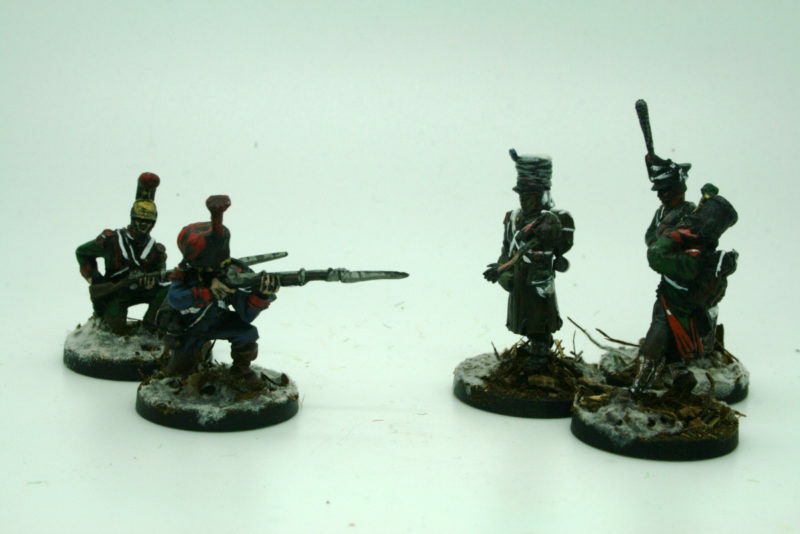 Home / Guests / Napoleonic Zombies! 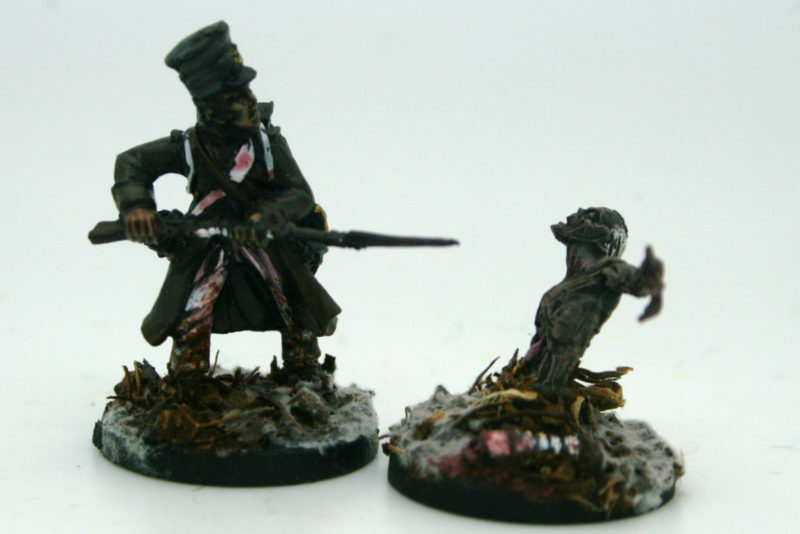 Comments Off on Napoleonic Zombies! OK, I know that the purists might find this a bit difficult but I was intrigued by these models that I found in the War Banner office. I just happened to be passing by and caught sight of these conversions and I was immediately curious as to what they were. 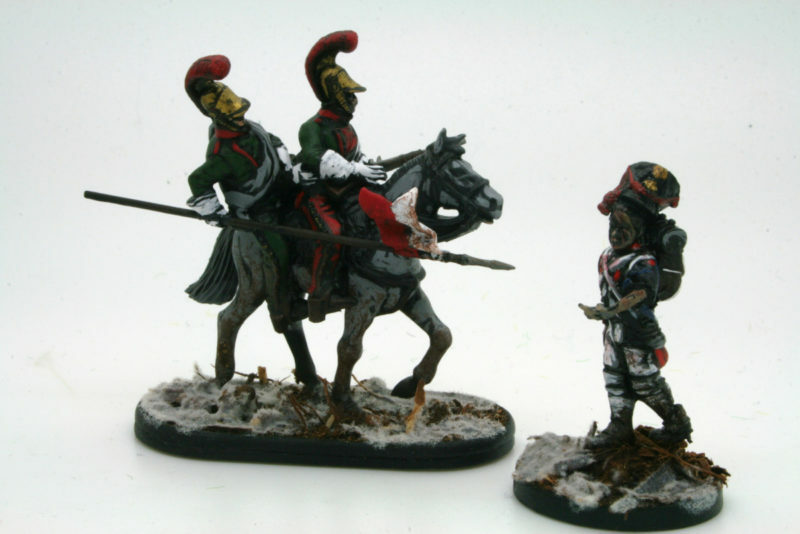 The models are made and painted by Darren Evans, co-designer of the very popular ‘Gangs of Rome’ game and so I immediately wondered if another game was in the pipeline! The short answer is no. The models were just an experiment but having a chat with Darren it was clear that there was a clever idea here for a fun game for the future. It was a great example of how perhaps people could be persuaded to have ago at Napoleonic’s without the need to invest in all the research required to turn out a Battalion of troops! And so the stage was set for a very different type of Napoleonic skirmish game. As you can see Daz hasn’t worried too much about the detail on the uniforms. I doubt very much that those involved in the retreat from Moscow were too concerned about Parade ground dress. Which also begs the question as to why some gamers get so hung up on the ‘right shade’ for a uniform but that’s a question for another blog. As for the Zombies, they really don’t care! 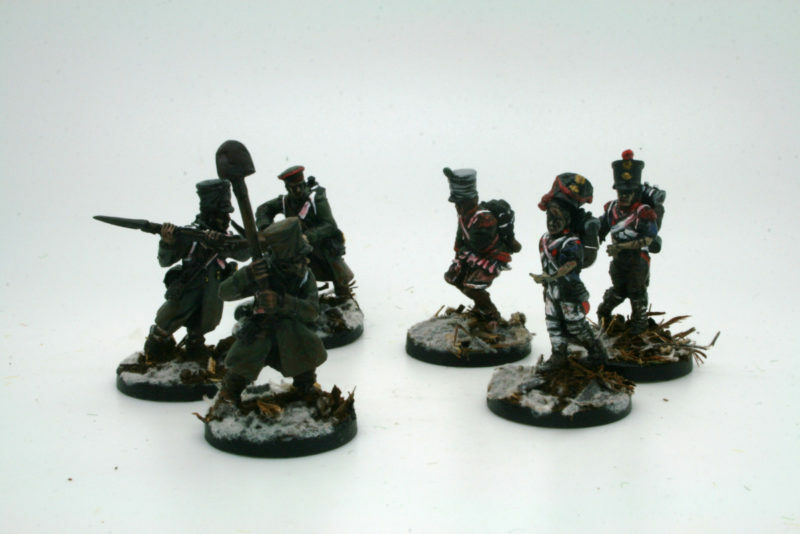 Regarding the conversions, the figures are a mixture of mainly Warlord Games Napoleonic plastics mixed up with some plastic Zombie parts or visa versa, depending on how far the contagion had taken! Daz simply took a scalpel to the figures and hacked away, adding a skeleton arm or leg as appropriate, or a uniformed arm, leg or head to a Zombie torso. There is no need to be too careful, the rough finish just adds to the overall look. 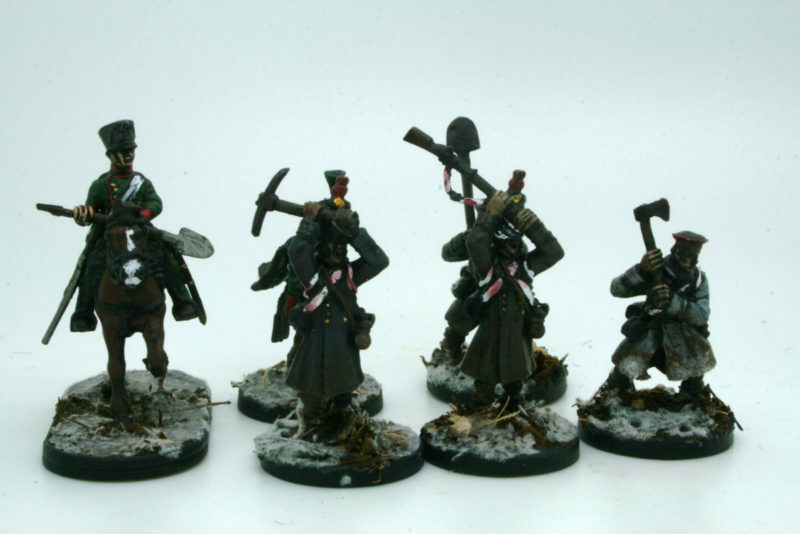 When a figure is added to a snowy base, the effect is excellent and immediately evocative of the Russian retreat. It’s only when you look closely at some of the figures that you realise there is a zombie problem! I wish we had a horse each…. The ‘normal’ French that Darren made to fight the Zombie menace were in the main armed only with hand to hand weapons. Muskets were not reliable in the freezing conditions and the idea was to make the conflict all the more desperate. The French were just fighting their way home and trying to escape the latest sinister menace that had appeared. The muskets aren’t as effective as a shovel! As I have said, there are no rules as such for a game. The models were more an exercise in imagination. 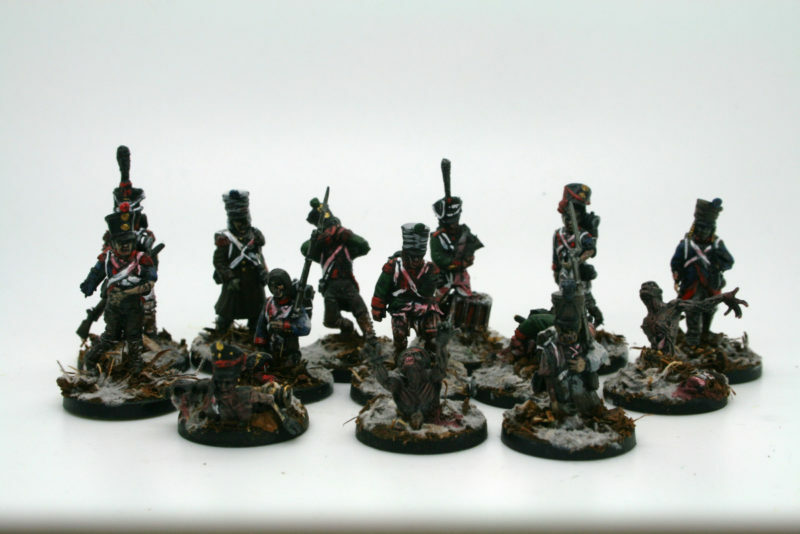 That said, I suspect it would be straight forward to incorporate a batch of Zombies into one of the many great Napoleonic skirmish games out there. Sharpe Practice and Over the Hills are two that spring to mind. I’m sure that you wouldn’t want to be playing Napoleonic Zombies every week but now and then, I think that this sort of stretch of the imagination brings the fun into gaming. 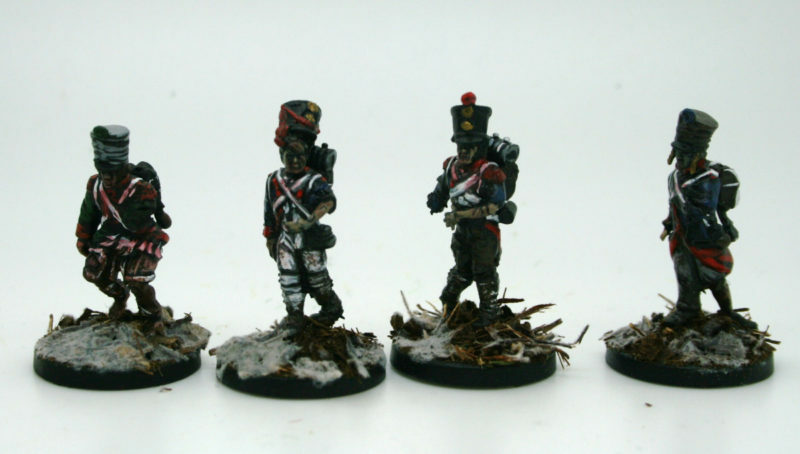 So there you are, Napoleonic Zombies – who would have thought of that? Sometimes it’s great to follow your imagination and who knows what ideas you can come up with. I think that Darren has done a great job with these figures and to see an idea through is impressive to me. Having an idea is one thing, actually making it is quite another! It’s that side of the hobby that I really enjoy and making and converting something a bit different is certainly a break from building my never ending Napoleonic army. But in the meantime, back to Waterloo next week and my latest batch of Nassau….